The start wasn't Pivetta's best in terms of runs allowed, but his Grapefruit League ERA still sits at a strong 3.31. The righty will make one more spring start and will then be lined up to pitch the Phillies' second game of the season March 30 against the Braves, Todd Zolecki of MLB.com reports. 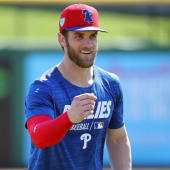 The fact that Pivetta will pitch ahead of Jake Arrieta in the rotation is a vote of confidence from the organization, indicating that the Phillies think the Canadian's 3.80 FIP last season is more representative of his true talent than his 4.77 ERA.